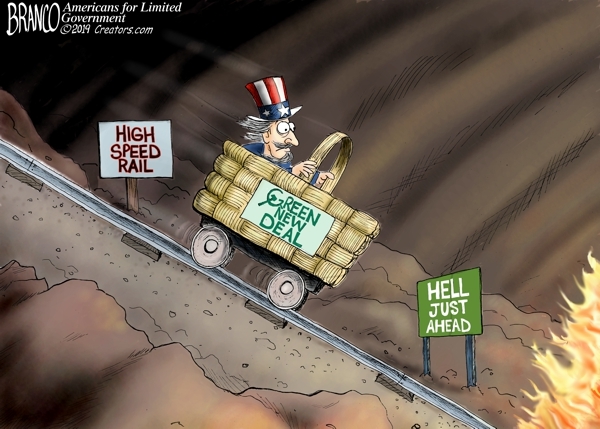 Senate Majority Leader Mitch McConnell (R-Ky.) announced Tuesday that he’ll bring up progressives’ widely mocked Green New Deal for a vote. The move is often used as a political tactic, which would force several Democratic 2020 presidential candidates to go on the record either for or against the radical proposal that has a massive scope and cost. Democratic Sens. Cory Booker (N.J.), Kamala Harris (Calif.), Elizabeth Warren (Mass.) and Kirsten Gillibrand (N.Y.) — who are running for president in 2020 — have all endorsed a resolution in support of the Green New Deal introduced by Sen. Ed Markey (D-Mass.) and backed by Rep. Alexandria Ocasio-Cortez (D-N.Y.). The Green New Deal was introduced with great fanfare last week, as dozens of members of Congress gathered for a news conference to roll out the sweeping new initiative aimed at weaning the U.S. completely off fossil fuels over the next decade. The rest of the details of the plan are muddled, after a widely mocked summary of the Green New Deal was published and subsequently removed by staffers of Ocasio-Cortez, promising jobs for people “unwilling to work” and vowing to get rid of “cow farts.” Days later, the congresswoman’s chief of staff called the release of the document a mistake, saying it “doesn’t represent the [Green New Deal] resolution,” the New York Times reported. Regardless, Ocasio-Cortez has admitted that implementing her multi-trillion-dollar proposal would require “massive government intervention,” which the average American voter may not be willing to get behind.